If you’ve been listening to PhotoNetCast for some time, you might be aware that although the majority of my work is done in digital medium, I never left film completely. 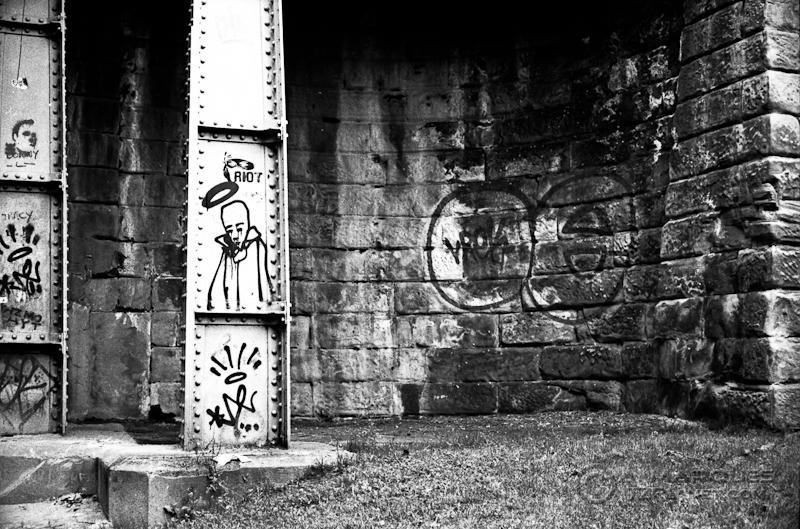 I’m not using it for stock or images that I know I might license, but the truth is I really like to photograph with a rangefinder or some middle format cameras, and I enjoy developing film. That said, I’m not making prints since the little amount of work can’t justify having a dark room (although I’d love one). As such, and probably the case with the majority of photographers still using B&W film, after developing the negatives the transition to digital happens. Below, I’ll try to explain my process scanning my Black and White negatives (next to “how do I develop film”, “how do I scan film negatives” has to be the mostly asked question I get when talking developing film at home). I’m not going to focus on equipment too much. I’ll just say that since I can’t justify the price of a good drum scanner (the best to scan negatives), I make do with a good flatbed scanner (probably the worst to scan negatives). I’m using a Canon CanoScan 8800F. If you go into photography forums discussing scanners, you’ll find that it’s worse than the Canon Nikon thing, so I’m just using something that gets the job done to a standard that meets my needs. This is the major focus of this post. Forget the software bundled with your scanner – it is probably very good for paper documents, but it lacks the refinement that a dedicated software gives you. I’ve been using VueScan (Hamrick Software) for some time and I’ve been very happy with it. Now, I’ve also heard that the learning curve for VueScan is steep. It’s true and things can go horribly wrong, but with a few tweaks (or maybe I should say getting rid of tweaks) the results are good. Have this in your mind: you will not get a perfect image out of the scanner. What you want is to grab as much information as possible from the negative, and work on it afterwards. This means, no clipping shadows or highlights, and minimal processing while digitizing the image. This will give you the best options for processing in some other software (Lightroom, Photoshop, Aperture, etc). I usually have my settings as “bland” as possible. No curves, no white balance, nothing. VueScan has a library of profiles for some common films, but not too extensive. I also don’t want to be thinking too much about contrast intensity when developing. So, I always go with a Generic profile (Color is the only option for brand – don’t worry about this, it won’t affect your result). I prefer to go as generic as possible because if you choose a profile, all you’re telling the software is to apply a set of adjustments that I prefer to apply on my own later on. Usually I do a full frame preview of one of the frames. The result will be far from optimal, and normally overexposed. 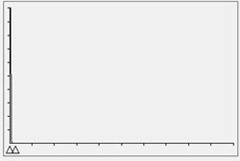 If you notice the image below, you’ll see that, although I have included the margins between frames, which should be the blackest you have on the negative, on the left the histogram falls off quite before the axis. Pure black should be right there on the left. What you have to do is tell the software what black is and adapt for that. Select a rectangle on the transparent margins (pure black on the positive). Notice that, as before, the density of black is not at the absolute left of the histogram. Now, check the box “Lock exposure”. See that value on RGB exposure? This value is unique for each film and is calculated based on the pure black you’ve just selected. Do not change the selection, and do another Preview. If you look now at the histogram, you’ll see that the black is shifted to the left, right on the axis where it should be. Now the software knows what black is and will adjust the exposure accordingly. Selecting the entire frame and doing again a full preview should show you the final image, with the exposure adjusted. 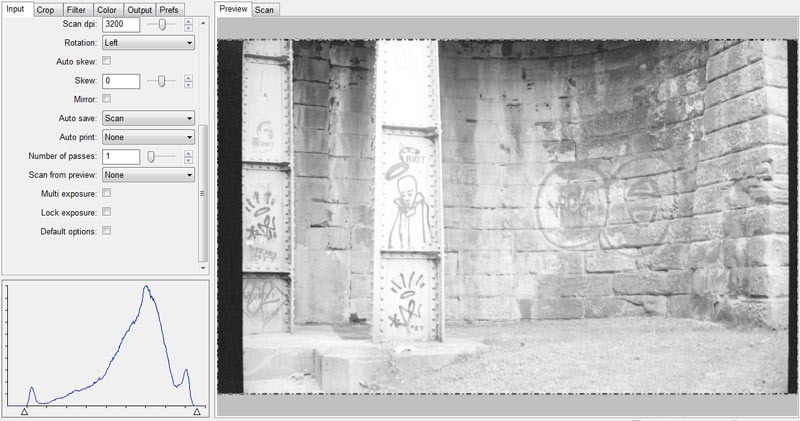 The blacks on the histogram fall off where they should and the image doesn’t look overexposed. Scan it to file (I do tif, but other non-destructive formats should work too). As I’ve mentioned, this is a “flat” image but contains the maximum of data that can be gathered from the negative. I won’t dwell much on post processing as that is not the aim of this article, and it will depend on your vision for that specific image. I use mostly Lightroom and tend to simply adjust the curves to increase contrast, maybe some dodging and burning if required, and spot removal if some dust grains escaped my cleaning. This seems like a complex process, but really isn’t. After you get used to it, it takes just a few extra seconds per roll. I usually do this once per roll and not, as I was already asked, for every frame. Actually, after I have the exposure locked, I set VueScan to batch scan all the frames. Some photographers, probably much more perfectionists than myself, emphasize the need to repeat this process for every strip. I don’t believe that differences in the developing process are going to be so noticeable as to require exposure locking on a per strip basis, but your mileage may vary and you should experiment. You should also have in mind that scanners have problems with very dense highlights (the very opaque blacks on the frames). You will get a better result by slightly under-developing the negative if your aim is just to digitize the film. Accordingly, pushing the film increases contrast and will require you to pay some more attention if you have very dense highlights but the principle is the same. I hope that if you use VueScan and aren’t getting what you expect, this guide will improve you results when you scan your film. As always, if you have any comments or questions, please post them below. This article was brought to you by Nations Photo Lab, a professional photo printing and photo hosting partner. Very useful article. Thank you for posting. 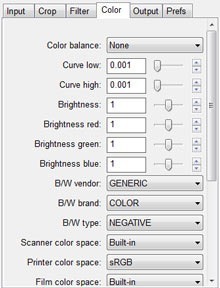 I am always interested in different techniques of scanning and the number of settings on VueScan. Quick question: what is the final file size when you scan ? Do you scan Jpeg or RAW/TIFF? I usually scan 16bit grey at 3200dpi. Each frame ends up around 4500x3000px totalling around 25MB, and always TIFF. Lossless and without compression. Some people like to scan higher resolution, some people scan lower res and re-scan if they need it. I haven’t been too discriminating so far, but I’m considering scanning at lower res (maybe half) the whole roll, check which ones I want to edit, and re-scan at 3200 or slightly higher. I’m usually not too worried because I know that I have the negative in case I want to make a big print and can re-scan. Even processing can be transposed to the new scan easily. I hope I’ve managed to answer your questions. Thanks Antonio – I’ve been using Vuescan off and on for a while now and you’ve cleared up a few things for me!. Now do one for colour – I need to learn from an expert. Love the Podcast too, regular listener and the recent Charity topic was inspired. Unfortunately my expertise with VueScan for color negatives (or slides) is very limited and just enough to get by. If I come across anyone who is an expert on it, I’ll get you a post in here. Thanks for the comment on the podcast too. It’s great to see our work being well received. Steve,While going thru a large box of prints and negavites on Sunday night ,just this last weekend, i almost set up the darkroom but then common sense kicked in ,so the Omega D2 will have to stay in storage in the spare room .. for now.I thought that you loved the fumes of stop bath and fixer through out the basement.Is is not great that we can copy & print negavites with the lights on while watching Sunday night football? thank you for your article! I am fighting with the problem of scanning my negatives. I have gone throught a largenumber of experiments(based also on other articles) and got the same method as you described. 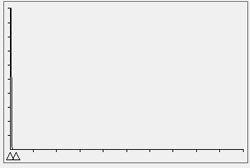 Just one notice/quastion: the un-adjusted linear curve has the figures 0,25 and 0,75, why do you have the curve low/high settings at 0,001? I have been scanning negatives using an Epson Perfection V600 Photo scanner and VueScan software. I do have a purchased copy of the software. Everything was working just fine. I placed a new negative (exactly like the previous one) and tried previewing. The scanner shut itself down. I rebooted everything, still can’t scan a negative. I tried using the Epson scan software and that did work, so it is not the scanner. I reloaded the VueScan software. Rebooted. Still not able to scan. Anyone have any idea what could cause this problem? Nice tip on getting black. I am scanning 35mm silver-based B&W negatives. My question: What Vuescan settings do you use to get the final file to be a positive image. I get a negative file no matter what combination of settings I use. I have the Vuescan User Guide. 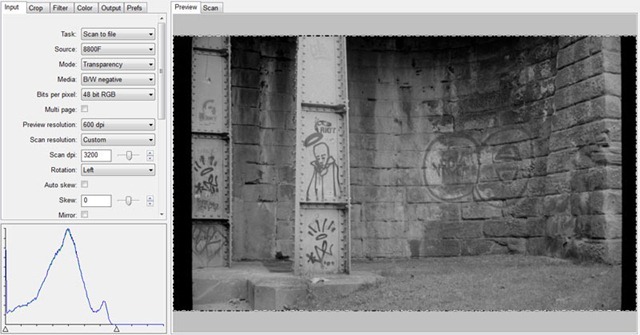 I can invert in Lightroom using the curves window, but I’d like the scanner software to invert. 2nd question: If you are familiar with the Nikon Coolscan 4000, can I use Vuescan to make the scanner scan a negative that is 72mm wide, not 36mm. I have been taking some wide frames with the Ordu pinhole camera. I’ve tried this several times and it doesn’t seem to work. Maybe it only worked with an older version of VS? When I select the black area, it lightens to grey, and the histogram is as you describe. Then I make a new preview, but the histogram/black point doesn’t move – it’s still in the same place, even when I later move the selection to a frame on the film. Maybe the software author changed something, or maybe I’ve misunderstood your directions. Either way, it doesn’t seem to work. Same with me. 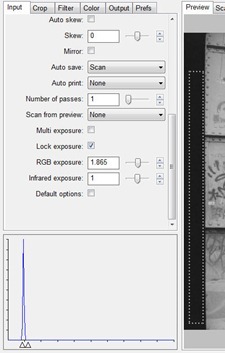 But I discovered it is not automatic : After preview of black margin and locking of exposure you have to rise RGB Exposure one step or two until the histogram will push on the left exactly as illustrated. In fact, I guess, it is only logical. If you don’t change the Exposure, how would you expect the histogram to change? I was advised recently by Hamrick Support, that as of the version 9.4.39 “update,” the Standard edition of VueScan ($39.95) the film scanning function has been removed. The film scanning function is available only in the Professional edition of VueScan ($89.95). To date, Hamrick has not updated their list of supported scanners, which still includes many dedicated film scanners. Very interesting collection of comments on your page – thanks everyone ! !